Coaches being replaced by machines? Not quite. At least not yet. 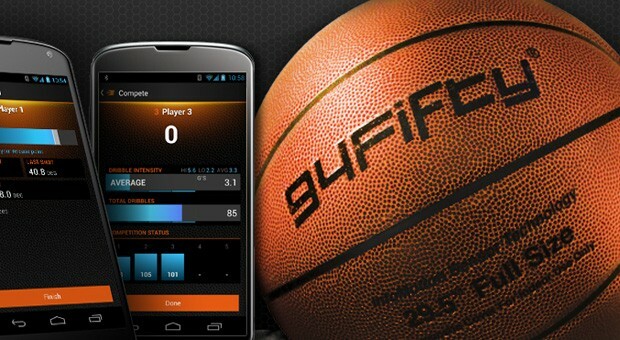 94Fifty is releasing a new high-tech basketball to the public to help players track their performance, even going so far as to provide feedback in the form of coaching. The 94Fifty smart basketball from InfoMotion Sports Technologies has sensors embedded in the ball that are able to detect forces from dribbling and shooting. The ball can then relay the data, through Bluetooth and new Android and iOS apps, providing information on shot arc, shot speed, backspin, and dribble angles among other things. Players can then track these stats through the app to help improve the finer points of their game. Expected out in late 2013, the ball will come complete with a Qi wireless charging pad. The 94Fifty basketball, which will retail exclusively online, will cost consumers $295 (you can get in early on the product at Kickstarter). While this is certainly an interesting new extension of sports analytics, we’re skeptical of the product’s effectiveness. InfoMotion Sports already has a ‘team model’ available on the market that performs very similar functions, and is essentially and earlier version of the new ball. That product, however, was meant exclusively for drills and training sessions, and was not advised for use in practice or game settings. While drills are useful, it’s difficult to track a player’s true ability in a controlled, solo training setup. Additionally, with the ball full of highly sensitive electronics, one has to question the durability and longevity of the product (especially since it’ll set you back $300). And then, as surely old school basketball enthusiasts will point out, there is the question of the ball handling differently than a standard basketball, and the cold hard truth that an electronic gadget lacks the expertise and practical knowledge that a quality coach can have. However, it is an intriguing new product and we’d love to be proven wrong. While the 94Fifty basketball doesn’t appear to be going ‘Terminator’ on basketball coaches anytime soon, it may prove to be a useful teaching aid. And for players without access to a coach, it just may be the next best available option (assuming these players have $295 lying around). Previous articleiPhone 5S, Samsung Galaxy S4 to bring wireless charging to the mainstream?